It's difficult to criticise this kit - about the only downside is its price, which puts it beyond all but the most flush of players. Start saving, though, because the Birch Custom Absolute meets its price level's rarefied high standards with ease. The clarity of design and attention to detail is exceptional. Many engineering innovations include the impressive Hook Lugs. Sumptuous finish and performance. Originally launched in 1998, Yamaha's Absolute Series has since become a byword for top-notch professional drum kits. Prior to the 2009 NAMM show the range was given a thorough upgrade. Absolute Series kits can be ordered in either birch or maple with drums of each of the woods being mixed across a kit as you desire. In addition, a choice of two lug designs can be fitted to each drum. We were sent a six-piece Birch Custom Absolute shell pack with Hook Lugs along with a Birch Custom Absolute snare fitted with regular Absolute Lugs. "When we arrived at the venue the rest of the band's faces lit up. When we began playing the kit their jaws slackened - it sounded so damn good"
At NAMM, Yamaha introduced more shell options across the Absolute Series. The review kit includes an all-new undrilled 22"x20" bass drum, while the 14" and 16" floor toms are shallower than previous models, coming in at 13" and 15" respectively. The tom sizes are 10"x8", 12"x9" and 13"x10", though these diameters are also available an inch shorter in depth. The supplied 14"x6" snare has a natural finish, but it can be ordered in the same eye-catching lacquer as the rest of the kit. Beneath the lacquer and lug options lie shells that are virtually identical to those found on Yamaha's legendary 9000 Recording Custom Series drums. Made with Hokkaido birch from Northern Japan, the shells are 7-ply, 7mm thick for bass drums only and 6-ply, 6mm for all other drums. While the birch shells of 9000 Recording Custom Series drums sport one-piece full-length lugs, the two lug options for the Birch Custom Absolute are rooted in minimalism. The regular Absolute Lug, featured on the first Absolute kits, remains unchanged and is a classic example of a low mass lug that fixes to the shell with a single bolt. 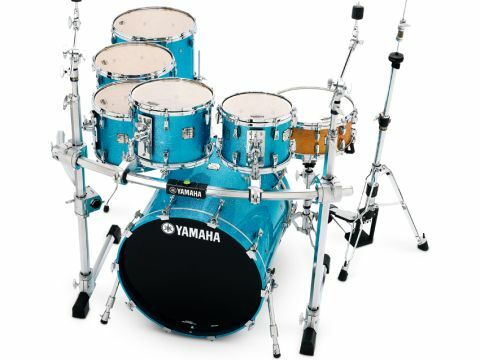 The alternative - seen here on all of the drums except for the snare - is Yamaha's innovative Hook Lug which is also found on the company's visionary PHX kits. Inspired by Yamaha's original quick-release Nouveau Lug, the Hook Lug occupies an even smaller footprint on the shell. The design splits the lug into two sections, with the bulk of the casing 'floating' above the shell. This outer section locks into place by hooking over a post that is itself attached to the shell by a single bolt. Hook Lugs also dramatically streamline head changing, as a few turns of a drum key is enough to unhook each lug from its post, in turn releasing the hoop. They are an optional extra and add around 15 percent to the cost of each drum. YESS II mounts are fitted as standard across the rack toms. These utilise rubber grommets to prevent the bracket making contact with the shell. The stunning Blue Ice Sparkle finish is one of nine new lacquer options, bringing the number of colours available up to 24. We tested the kit with a glam rock tribute band and when we arrived at the venue, the rest of the band's faces lit up. When we began playing the kit their jaws visibly slackened. Not because of some overnight improvement on our part, but because the kit sounded so damn good. Birch gives an excellent response across mid and lower tones while at the same time possessing an aggressive edge. And that more or less sums up the kit's performance. The bass drum's massive note was low enough to be filed under 'subterranean', yet it had a sharp presence that placed it in the heart of the mix. Similarly the snare sliced across proceedings with razor-edged precision, providing a bright, crunchy note that found all four corners of the room. The toms also delivered fabulous tones, with the elements of attack, warmth, resonance and sustain present in balanced ratios. Extra bite was imparted to the snare and toms through the aluminium die-cast hoops which also held the tuning rock steady. Though the kit had to compete with a glitter-strewn bank of Marshall and Hiwatt amps, the quality of sound it produced was unmistakable. There is an inherent smoothness to these drums, a level of finesse that you rarely find in any instrument. In short, a class act.